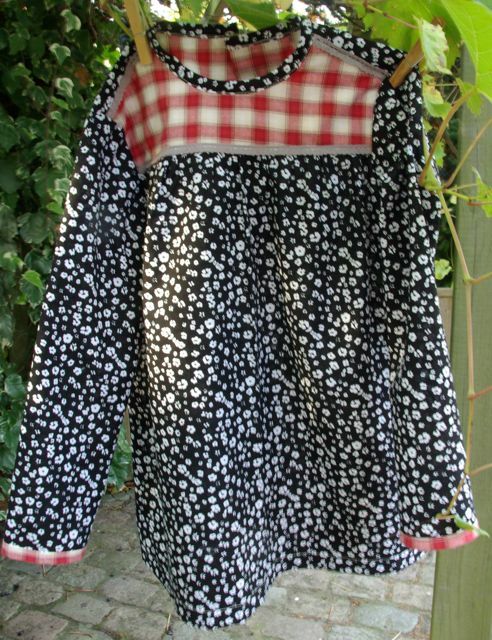 If you follow this blog you may remember that in the first post about pulover of DamDam I have ambitiously announced about the following upcycling idea with the sleeves. Believe me it is coming ! The idea exists but the realisation is still pending. The famous sleeves of old pulover take their new place in the poncho. As I have tried to make the design myself it takes time. 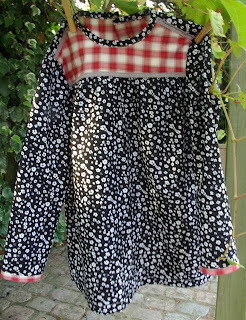 To make a brake I have made today the new girl dress. New and old stuff together. It is not completely upcycled. Only red fabric is the old shirt of Ivan. Son of my good friend. I called this dress Ivanna. I have used very nice ribbon from Old Stuff Shop.